File Types: EPS,JPG,All Files; File Size: 1.52 MB; Requirements: Adobe CS1+; Vector: Yes. 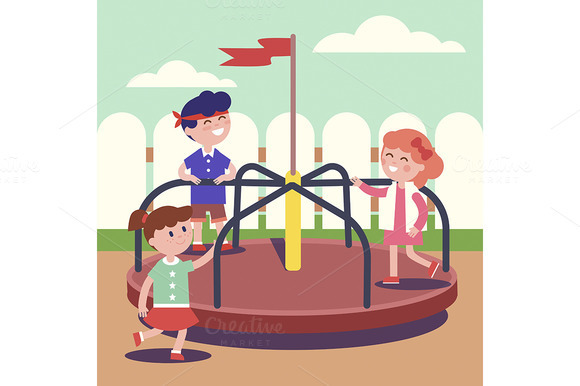 Group of kids playing game on rotating roundabout carousel at the playground. Childhood happiness and smiling faces. Modern flat style vector illustration cartoon clipart. Keywords: flat, icon, vector, isolated, illustration, symbol, sign, object, white, template, background, design, cartoon, clipart, character, kid, child, children, small, people, person, childhood, young, infant, play, fun, joyful, joy, cute, youth, smiling, caucasian, cheerful, human, boy, male, man, preschooler, schoolboy, girl, female, woman, lady, schoolgirl, kindergarten, kindergarden, preschool, playschool, group, outdoor, park, together, togetherness, public, playground, site, area, court, ground, equipment, town, playing, carousel, roundabout, carrousel, whirligig, ride.